…I shall attempt The Viking Turid for my Knitting Olympics glory. Because Michaels failed me utterly and did not have baby yarn I liked. HINT, MICHAELS: Baby yarn should not be scratchy or fuzzy. It would also be nice if they had something other than pastel pink, blue, yellow, white and green. Sure, those are the ‘most popular’ colors and all, but what if you’d like to make something a little less Easter, huh? What if I’d like a nice natural sort of color scheme, like rich browns or greens? Huh? What then, Michaels?! ANYWAY. So, I’ll be on the hunt for baby yarn at Stitches (I was going to order it over the Internet and even had it in my cart online but then suddenly I was all, DUH!, because Stitches is only a couple weeks away…of course, this means that daddy will have to do the adult-supervision-at-Girl-Scout-cookie-selling one day that weekend but oh well. 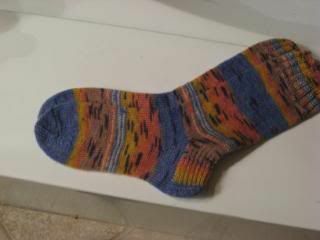 If he wants the socks – and he does – he better be nice to the knitter, yo…), and casting on Turid for the Olympics. Assuming, of course, that I can get gauge with this yarn, and that it doesn’t knit up poorly at said gauge, and…well. The Imponderables, they are many. So here, let me distract you with some socks! Because guess what? I found the camera! Yay, me! 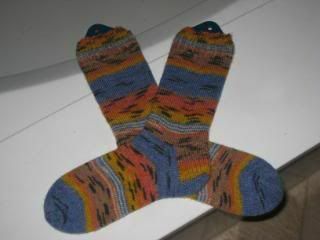 These were made with Opal Sockenwolle, in ‘Tender Dinghi.’ A friend bought it for herself, but wasn’t feeling the love for learning to knit socks just yet (she will be assimilated, eventually) so she shoved it at me and asked me to make them. Sweet! This is just your basic sock pattern for a women’s medium-large sock. 2x2 rib at the top, straight stockinette down the leg and foot, the slip-one-knit-one heel flap thing (which pulls the heel in a bit for fit and seems to make for a harder-wearing heel, which I like), and my usual lazy toe decrease, which I use because it is easy for me to remember: Decrease round, knit FOUR rounds plain, decrease, knit THREE plain, decrease, knit TWO plain, decrease, ONE, then decrease like mad until you’ve got sixteen stitches left altogether. Then Kitchener and you’re done. Unless Kitchener still requires cussing for you, in which case, cuss and you’re done. The thing I marvel at with these little babies is that they are identical twins. See? This yarn had a wickedly long pattern repeat, is the thing. And I was making them a little longer / bigger than my norm, and when I realized just how long the pattern repeat was on these I started thinking, Hope she likes fraternal twins… because you know how that is: You get to the end of the one, and have to pull out 1,800 yards to get to the same starting point for the next one, and then you get, like, to the middle of the heel and whoops, now what…? But then I got to the end of the first sock and lo!, it was mere feet from the starting point! You would think I won the lottery, y’all, I was so excited. The whole train car was cheering for me! Probably because I looked somewhat dangerous with all those shiny metal needles in my hand. But who cares? THEY CHEERED!!! YAY, ME!!!!!!!! Right. Well, it being legal for me to do my gauge swatch before the opening ceremonies, I suppose I should use the rest of my sittin’ around waiting for my appointment start time to do that, instead of blogging. …then again, betcha Shaun White can’t do Kitchener stitch without having to look it up, that’s right! In yer FACE, Shaun!!!!!!!! Ooh! What day will you be at Stitches! I'd love to cross paths and meet the woman who has the best way ever of telling stories (that would be you).